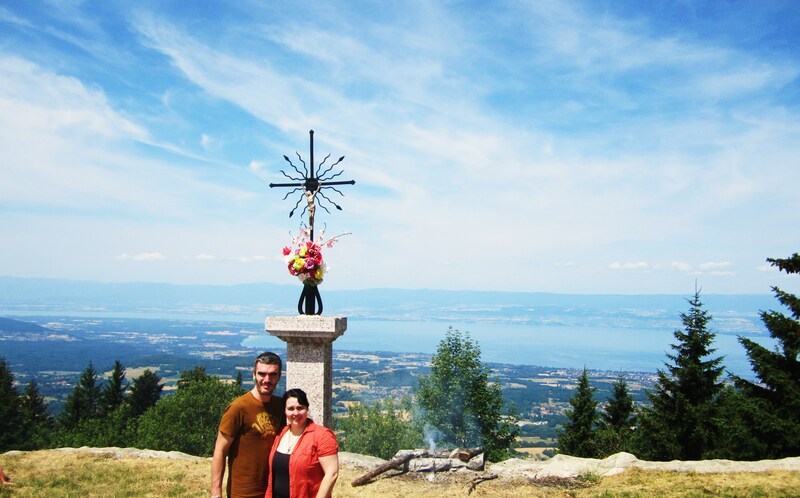 Last Sunday, mon ange and I accompanied his brother and mother on a hike to La Chapelle Hermone, which is a tiny little chapel located on the top of (I’m not sure whether to call it) a hill or mountain that is part of the Alps. It’s not like the mountain you picture in your head with the snow and dangerous peaks to traverse but still a steep climb with trees, etc. I didn’t have enough room in my suitcase to pack my hiking/climbing gear with me when I came to France, so I made do with jeans, a tank top, and button-down shirt that I kept open. At least I had good shoes for the climb. We drove to the starting point, and as I was looking out the window, I felt like I was entering a forest realm of a fairy tale. There were even some times that I was inspired to write a piece of short prose, but I have a bad habit of procrastinating and/or starting a story that I never finish. It’s not a secret that I’m wanting to lose weight and get in shape. After only three weeks here, I can already tell a difference in my body and energy. I have a Fitbit, and while it was difficult to obtain the goal of 10,000 steps back in the U.S. where I lived, I have now reached that goal 7 times here in France. C had the good idea to increase my goal to 12,000 steps after I’ve reached 10,000 steps 10 times. That means I’ll have to kick my rear into gear even more. The secret to reaching the desired amount is to go walking and exploring for a couple hours. I didn’t reach 10,000 steps when we climbed to the chapel, but it was a more intense workout than usual. We packed water for hydration, and I had to stop and drink every so often. We picked a day that wasn’t too terribly hot, and when we were hiking in the trees, the shade created a nice coolness. When we were close to the summit, we discovered a series of crosses dedicated to the Stations of the Cross for Christ’s passion. I had never read each station in French before, and as I climbed, I meditated on what Jesus went through. I might have been out of breath and sore from all the climbing, but it was nothing compared to what He experienced. As I reached the top, I felt a wave of relief wash over me and took in the view with awe. I can’t remember exactly how high up we were, but on one side we could see the towns and Lac Léman and on the other, more of the Alps stretched out before us. It was amazing. We sat down to eat our picnic of ham and cheese baguette sandwiches and nectarines at the steps of the chapel. At first we didn’t realize that it was the entrance, but when people approached to enter it we made room so they could get by. After eating, I wanted to go inside as well. On the wall just in the entry, there was a large plaque with names of people that contributed financially to the Stations of the Cross. One of the sets of names was Mary and Joseph Thomas. I thought that was interesting. Oh, and by the way, they were installed in 1840. The chapel itself was older. I can’t get over how old and historic the monuments that I come across are! The entryway to the rest of the chapel was barred in order to preserve it, but you could still peek inside and read a prayer. C encouraged me to sing something because the acoustics were great. So I sang an improvised version of O Magnum Mysterium without lyrics. In one of the corners, there was a little area of tealight candles. I lit one in memory of my Grandma that passed away this March. She would have loved coming there. Yesterday was Bastille Day, which is the French national holiday equivalent to the 4th of July in the United States. They aren’t as crazy as Americans are with flags everywhere and all the national pride, but they do have a little celebration. We went to Evian for dinner and to watch the fireworks later in the evening when the sun went down. And if you recognize the name Evian, that’s because it’s where the bottled water is manufactured. I know you’ve seen water bottles with the name on it in your local grocery store or gas station. Well, each and every bottle came from the center here in France that’s in the town right next to where I live! We had several hours to wait between dinner and fireworks, so we explored the shops and walked along the lake. There were tents set up selling everything from churros to cotton candy (fun fact: it’s called La barbe à papa). When there was an hour and a half before the fireworks would begin, we claimed our spot to sit and watch them. Other people had been staking out a place even longer before us. We chose to sit on some large rocks around the edge of the lake. All the lights around port extinguished when it was time for the display to begin. We oohed and ahhed at the bright fireworks. To be honest, there isn’t much difference between American and French fireworks, but I do appreciate the reflection against the water here in Thonon. Getting back home was a bit of a nightmare. Luckily, he has a scooter, so we were able to weave through the engorged traffic to get home. But 30 minutes or more of sitting on the not-so-comfortable part of the scooter tends to turn your bum numb. I was very glad to reach our apartment at the end of the evening. And so ends the latest installment of my adventures in France….